Thank you for your interest in our undergraduate Marine Science and Atmospheric Science programs at the University of Miami. The Marine Science program offers a Bachelor of Science degree in marine science with a second major in biology, chemistry, geology, physics or another approved science. The program also offers a Bachelor of Arts degree with a major in marine affairs and a minor in anthropology, business, communication, economics, geography, or political science. The Atmospheric Science program offers a Bachelor of Science degree in meteorology, with a minor (or second major) in mathematics. 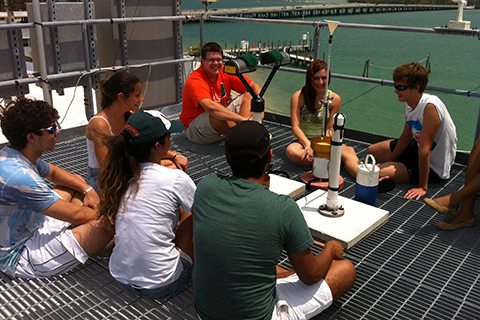 Our Marine Science and Atmospheric Science undergraduate programs, among the nation’s finest, are ideally located on the University of Miami main campus in the suburban community of Coral Gables, minutes from our graduate school and research facilities at the University of Miami Rosenstiel School of Marine and Atmospheric Science (RSMAS) on Virginia Key. We have easy access to Biscayne Bay, the Atlantic Ocean, and the Gulf of Mexico. • If you plan to visit the Coral Gables campus and would like to schedule an appointment to meet with an advisor from our Program, kindly call the Marine and Atmospheric Science office at 305-284-2180 or email us at the address below with your name, amount of people joining you, phone number, and date you will be visiting.